Prominent blogger and considered as one of the most vocal defenders of Pres. Rody Duterte on social media initiates a donation movement to commemorate the birthday of Pres. Rody Duterte. In just 7 hours, they were able to breach the 10K USD mark. According to Krizette Chu they were surprised that after seven hours of posting the callout for donations, the supporters of Pres. Rody Duterte were able to donate more than $10,000 or equivalent to more than half a million pesos. The callout for donations was made through the joint efforts of all the supporters of Pres. Rody Duterte on social media as they proved once and for all that they were indeed real people and not trolls. The organizers of the said donation campaign announced earlier that all the proceeds will go directly to the charity of choice by no less than Pres. Rody Duterte. Update: As of posting time, the total amount donated reaches $13,566.56 or equivalent to more than P715,000.00. Only seven hours after posting the callout for donations to commemorate the President's birthday, we've breached the 10k USD mark. In seven hours. All the people we can help, because we were inspired to be better Filipinos. Thank you everyone! Thank you to those who shared this too. Keep them coming. Please continue to share. Juanito Dy Jr.: Good job Krizzette! Shows how people are trusting you more than the politicians and the decayed hepa troops. Congratulations and God bless you, ma'am Vice President! Rolano M Mariquit: ....grabeh, lahi ra gyud di ba mga Dilawan?..More power and blessing to those who donate for a very good cause....Kaya Aling Leni, Maria Ressa, Risa, Bam, Kiko, Drilon, Trililing, Alejano, Dilawan, etc...umayos ng mabuti para mahalin ng tao...tingnan mo toh, wala pang 24 hours, $10K agad ang suporta...para sa KABUTIHAN. Miles Espique Velarde: ohmy. Power of the People. gave me goosebumps. Nico Alexis Morales Babac: What a way to celebrate the birthday of our president. May God continue to guide him for the sake of our dear country! To all who donated, God bless po! Elmo P Rodriguez: Iba talaga ang fund raising na may true cause. Bakit kaya di na uso ang kapamilya kapuso mag fundraising? Bakit noon kapag may bagyo halos buong pilipinas na LGU mag declare ng state of calamity? Dahil ba na madali lang noon ma release ang calamity fund? Pasingit lang ba tanong yun pero sa fund raising ng isang supporter nagtutulungan kapwa supporter. 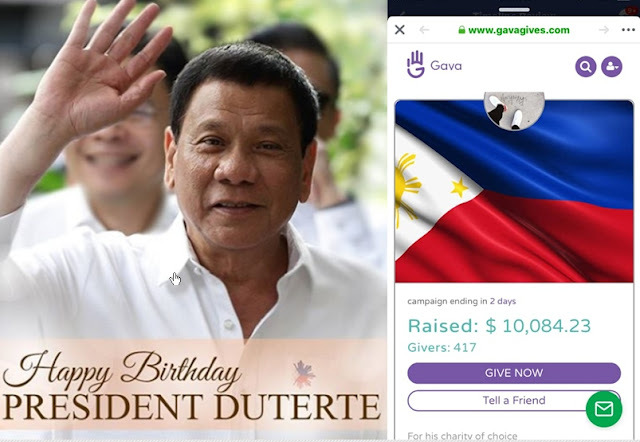 If you are willing to donate any amount to the cause of Duterte Supporters as a sign of Birthday Greetins to the President, Please proceed directly to the official Website of GavaGives by clicking the link below.